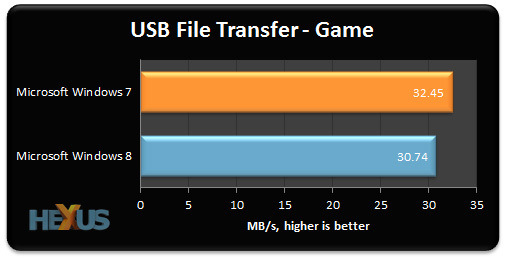 Following on from the previous page, we're running the same three file-transfer benchmarks, only this time using a Kingston USB 3.0 pendrive as the target. 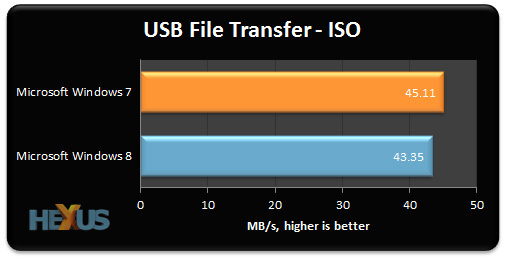 We've run the ISO test a couple of times, but the numbers are consistent. When copying just a few large files, Windows 7 is marginally quicker of the two. Combine numerous small and large files, and the two operating systems are closely matched. 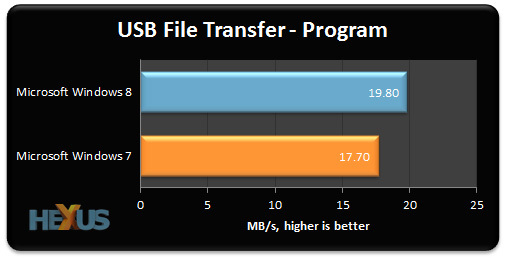 Windows 8 had the edge via SATA and Windows 7 has the upper hand via USB 3.0, but there's very little in it. In the majority of our 21 benchmarks, Windows 8 is at the very least as quick as Windows 7, and in some cases - notably start-up and browser performance - it's visibly quicker. The key fact to take away is that Windows 8 will not hamper performance; upgrade any system from 7 to 8 and it'll run just as fast, if not faster.